Urban vigilante Gwen Stacy and her police captain father haven’t been on the best of terms since she revealed her secret identity as Spider-Woman to him, but it’s time for them to have a much-needed chat. Gwen’s life is becoming increasingly dangerous as supervillains and cops (led by Captain Frank Castle, a.k.a. The Punisher in the regular Marvel Universe) try to take her down, and her father is acutely aware of the threats to his daughter’s safety. 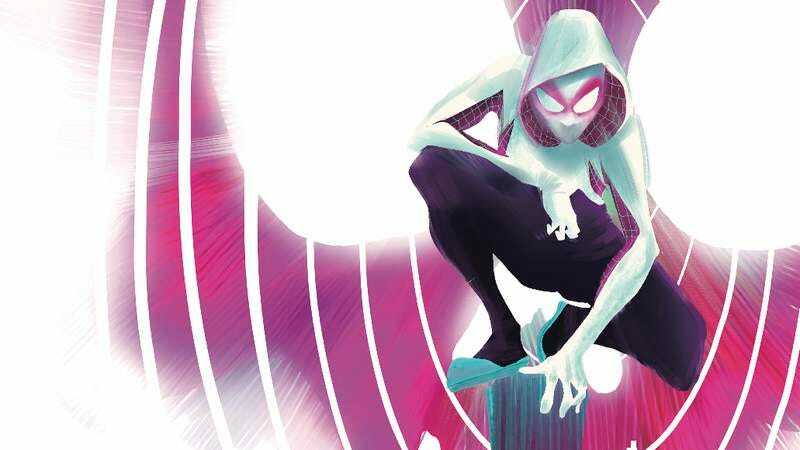 In this preview of next week’s Spider-Gwen #3, George begs Gwen to give up her secret identity and go back to life a normal young adult woman, but anyone that knows superhero comics knows what her answer is going to be. Writer Jason Latour has been having a lot of fun working in the alternate universe of this title, introducing familiar Marvel faces with new twists to their characters. Matt Murdock works for New York City’s Kingpin instead of against him, Ben Grimm is a grizzled cop, and at the center of it all is superhero Gwen Stacy trying to balance the pressures of her personal life with those of her vigilante lifestyle. Gwen’s characterization is a blend of Barbara Gordon (hip young hero with cop father) and Peter Parker (bit by a radioactive spider), but the creative team has given her an attitude that distances her from those influences.